, D. D. son of Emanuel, and grandson of Andrew Gifford, both dissenting ministers of the baptist persuasion, was born Aug. 17, 1700, and educated at Tewkesbury in Gloucestershire, under the Rev. Mr. Jones, author of the “History of the Canon of the Scripture,” whose seminary produced, among other eminent men, archbishop Seeker, bishop Butler, and Dr. Chandler. Mr. Gifford finished his studies under the celebrated Dr. Ward, and being afterwards baptised, was joined to his father’s church at Bristol, but in 1723 removed to the baptist meeting in Devonshire-square, London. In 1725 his first ministerial duties appear to have been performed at Nottingham, where he was very | popular. In Feb. 1730 he was invited to London and ordained. The following year he commenced an intimacy with sir Richard Ellys, bart. (see Ellys) and became his chaplain, taking the lead in family worship. Lady Ellys continued him in the same office, with an annual present of forty guineas, until her second marriage in 1745. One of Mr. Gifford’s sermons preached in commemoration of the great wind in 1703, and published in 1734, was dedicated to sir Richard. 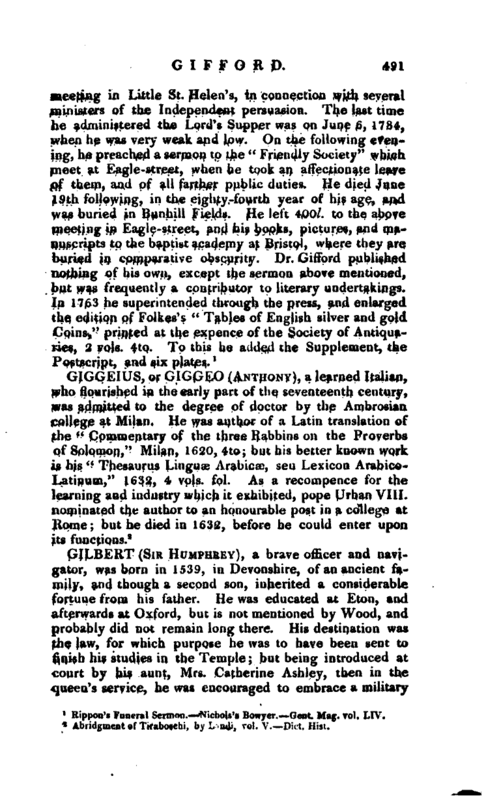 In 1754 Mr. Gifford received the degree of D.D. from Marischal college, Aberdeen. His favourite study was that of antiquities, and although at no time a man of opulence, he made a very large collection of curious books, Mss. coins, &c. for which he gave liberal prices. It is said that his collection of coins, which was a very valuable one, was purchased by George II. as an addition to his own cabinet. 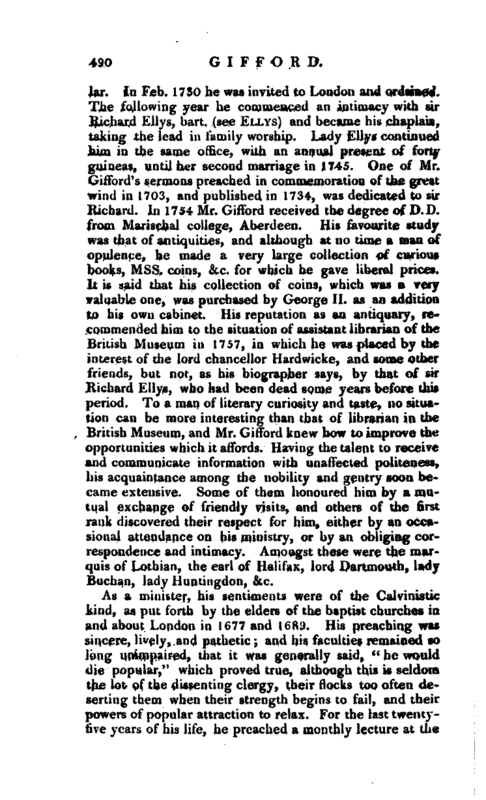 His reputation as an antiquary, recommended him to the situation of assistant librarian of the British Museum in 1757, in which he was placed by the interest of the lord chancellor Hardwicke, and some other friends, but not, as his biographer says, by that of sir Richard Ellys, who had been dead some years before this period. 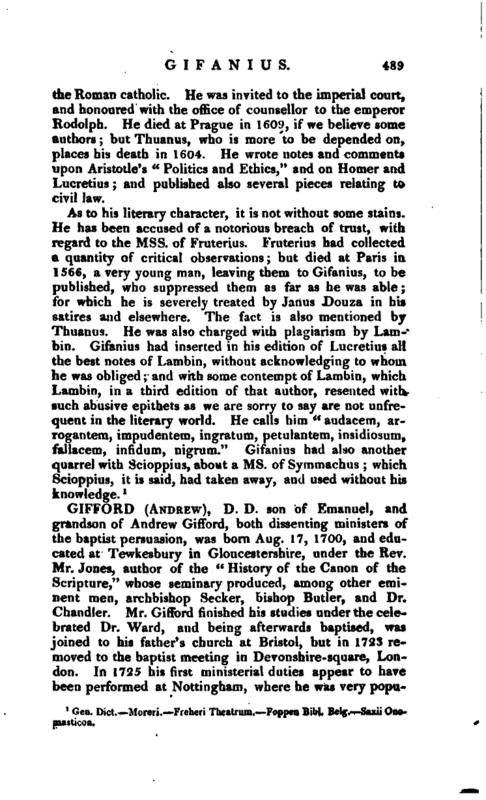 To a man of literary curiosity and taste, no situation can be more interesting than that of librarian in the British Museum, and Mr. Gifford knew how to improve the opportunities which it affords. Having the talent to receive and communicate information with unaffected politeness, his acquaintance among the nobility and gentry soon became extensive. Some of them honoured him by a mutual exchange of friendly visits, and others of the first rank discovered their respect for him, either by an occasional attendance on his ministry, or by an obliging correspondence and intimacy. Amongst these were the marquis of Lothian, the earl of Halifax, lord Dartmouth, lady Buchan, lady Huntingdon, &c.
Rippon’s Funeral Sermon. Nichols’s Bowyer. —Gent. Mag. vol. LIV.